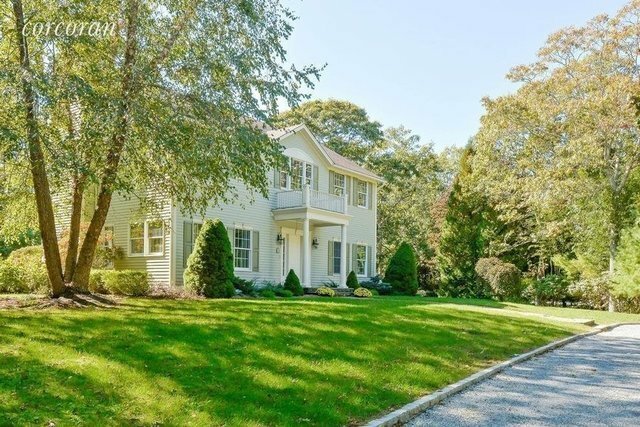 Rental Registration #: 19-81 Recently reconstructed and redesigned, this gracious traditional home is sited on a beautifully landscaped and private near acre in Montauk's Hither Woods, just an 8 minute to the beach. The entire first floor has been reconfigured to create an open floor plan encompassing a sparkling brand new kitchen, bright and sunny dining area/ living room with fireplace, and two "bonus rooms" that can be utilized as a formal dining room or den or office. All floors on the main level have been replaced with lustrous hardwood flooring throughout. Sliding doors off the kitchen lead to an inviting backyard deck, overlooking the in-ground pool; perfect for integrating indoor/outdoor entertaining. The beautifully appointed Master bedroom plus two equally appealing guest rooms are on the second floor along with a marble Master bath with jacuzzi, huge custom closet, and an additional custom bath. The lower level has also been totally renovated with tile floors, fully finished living areas and a fourth bedroom with a private bathroom. The fully fenced and gated property can be accessed from a "walk out" door at this level. A detached two car garage, circular drive and thoughtful landscaping for privacy complete this picture perfect property!.